“I would not walk down that street by myself,” she said. More people are without homes in the Seattle area than in other cities our size. Only the New York, Los Angeles, and Las Vegas areas have bigger homeless populations than King County. To understand how we got here, you have to go back to the early 2000s, when a high-tech bubble fueled rising home prices in the Seattle area and the federal government cut funding for homeless services and low-income housing. A group of government and non-government officials in the Seattle area grew tired of just helping individuals cope with life on the streets. “At some point, you have to ask yourself the question, ‘Is it good enough to simply serve people year after year without trying to significantly change the problem? '” said Vince Matulionis with United Way of King County. Matulionis was part of the group that formed the “Committee To End Homelessness” and launched King County’s 10-Year Plan To End Homelessness. Around the same time, the Bush administration essentially required communities around the country to come up with these kinds of plans if they wanted to keep getting federal dollars to help the homeless. The Bush administration focused on ending chronic homelessness. People who have been homeless for a year or more are a small but costly fraction of the population in need of help. Many communities, including the Seattle area, aimed higher. They came up with 10-year plans to end all homelessness. Seattle’s liberal voters and politicians don’t mind spending money on social problems. And there’s a lot of money here. King County has the largest United Way in the country. The Bill and Melinda Gates Foundation — the world’s wealthiest — puts money toward the homeless in its home town. Yet the effort is losing ground. Get to know even a few homeless people, and you’ll quickly learn there are many ways to wind up on the streets. Dozens of homeless men packed the Connections shelter in downtown Seattle one morning, staying warm and dry, using the Internet, or just dozing in their chairs. For Gary Eyerly, the problem has been affordable housing. He said even if he finds work, he thinks he’ll still have to stay in a shelter a while to save enough money to get housing. “They need to quit trying to charge $1,300 a month for a 400-square-foot studio,” Eyerly said. “Yeah, like they’re doing in the U District,” added another man. Jonathan Murrell said his life spiraled out of control after a car accident in 2012. “Hurt my shoulder. Snapped my neck. I was unable to work for a while, and I just fell down on bad luck,” he said. Murrell said he hasn’t had housing in years. Though he lives at the other end of the economic spectrum, Dan Brettler, chief executive officer of Seattle-based Car Toys, is familiar with all these scenarios. Brettler has been vice chair or co-chair of the Committee To End Homelessness since it began. Homeless advocates point to forces far beyond the committee’s influence: everything from broken mental-health systems to racial disparities. 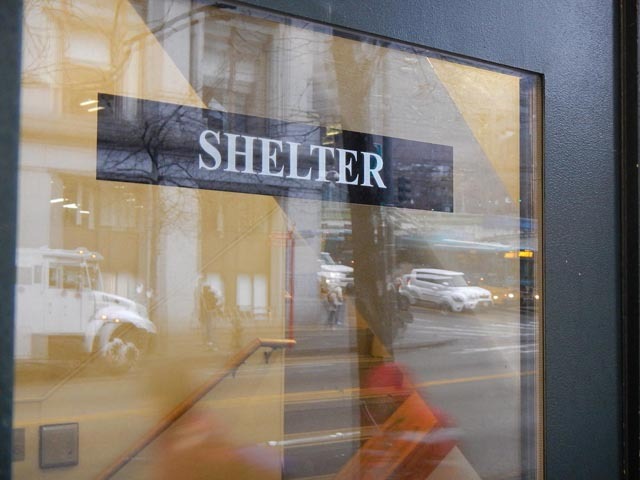 Two-thirds of all homeless people in King County’s shelters and transitional housing are people of color, even though people of color only make up one third of the county’s population. Brettler singled out the recession that hit midway through the 10-year plan. But he said even the booming economy of present-day Seattle is still dumping people on the streets. And this might not be the kind of talk you’d expect to hear from a CEO. Of course, many of those economic trends aren’t limited to King County. So, why is homelessness getting worse here when it isn’t nationally? One reason, according to the United Way’s Matulionis: King County’s 10-year plan didn’t focus enough on root causes, like the lack of affordable housing. Among other things, the 10-year plan focused on providing permanent housing for the homeless rather than shelter beds. But since housing is expensive and slow to build, the county wound up with even more people lacking shelter of any kind. The Committee To End Homelessness has been working to revise its strategy, now that the 10-year plan is ending and local homelessness is worse than ever. “The fact that it has not been ended reminds us of the need to be humble in all things,” Robert Taylor said. Taylor was dean of St. Mark’s Episcopal Church in Seattle when he became the first director of the Committee To End Homelessness, a position he held until 2007. Current committee members mostly avoid saying anybody did anything wrong or promised too much in the old plan. The language of choice is that they’re “pivoting” to a next chapter. Talk of ending homelessness is being replaced with less-lofty aspirations: making homelessness rare and brief when it does occur. King County has a long way to go on both those goals. Right now, people typically go without a home for more than four months. The goal is three weeks. Committee members say the strategic plan now in the works will enable them to help the homeless more effectively. But they say that tackling root causes of homelessness, like inequity, can’t just be one committee’s job. Without effort from the rest of the community, Colleen Kelly with the City of Redmond said, efforts to tackle homelessness will only bring more of the same. Mark Putnam, who took the helm of the Committee to End Homelessness a year ago, underscored the challenge ahead while speaking to members in January. “It is the issue that our entire community should be focused on, when we have people living and dying on our streets in King County,” Putnam said. It’s been 10 years since the Seattle plan to end homelessness was launched, and the number of homeless people here has surged. Fundamental, or on the Chopping Block?